For all the talk of an Internet of Things, many Bluetooth devices aren’t very internet-savvy; they usually have to rely on WiFi (or another gadget entirely) to hop online. That’s going to change very shortly with the advent of Bluetooth’s new 4.2 spec. If a sensor, smart light bulb or other low-power device supports the new technology, it can connect directly to the internet (through a router or other access point, at least) without needing a go-between. That’s potentially huge for home automation — you could control all your appliances and light fixture from anywhere in the world without requiring special hubs. There’s a lot more going on besides this, of course. Privacy is now much more important; Bluetooth 4.2 makes it harder to track a device without your permission, so a store with iBeacons (as an example) can’t follow you around unless you’ve installed an app. The new wireless tech is also up to 2.5 times faster, and it should be both more power-efficient and reliable. The gotcha with all these updates? You’ll have to wait. 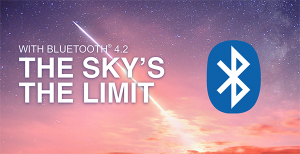 The Bluetooth 4.2 standard is ready now (internet access is due within a month), but device makers will still have to implement it before you can see any benefit. You probably won’t get to use 4.2-capable devices until sometime in 2015 as a result, but there are enough heavy-hitting features that your patience may pay off.